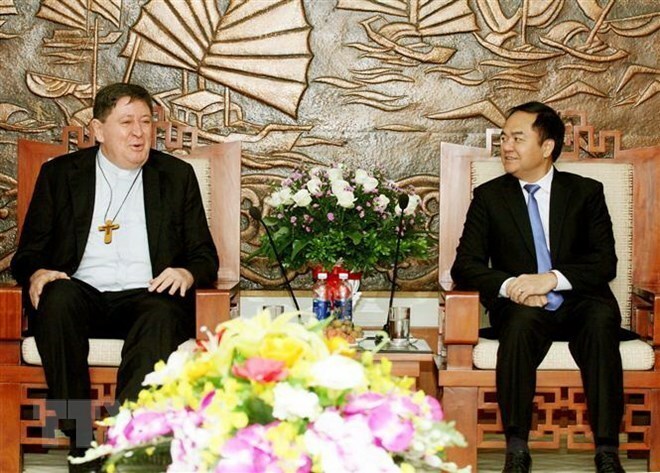 Hà Nội (AsiaNews) – Card João Braz de Aviz (picture 1), prefect of the Congregation for Institutes of Consecrated Life and Societies of Apostolic Life, made a pastoral visit to Vietnam, centred on evangelisation and the religious ministry. During the visit (2-7 September), the Brazilian cardinal took part in the Conference of the Association of Asian Convents organised by the Archdiocese of Saigon (Hồ Chí Minh City). At the gathering, he met with bishops, priests and religious from across the country. When he arrived in the Diocese of Xuân Lộc (Đồng Nai province), hundreds of consecrated persons were present to give Card Braz de Aviz a warm welcome. The following day, in the Bishop’s Office in Hồ Chí Minh City, he met with Card Gioan Baotixita (Jean-Baptiste) Phạm Minh Mẫn, archbishop emeritus, and the clergy of the archdiocese. In the afternoon, the prelate went to the diocesan pastoral centre and led a memorial service for the martyrs of Vietnam, for whom this year the Church celebrates a special Jubilee. On the morning of 4 September, the Conference of the Association of Asian Convents opened at the pastoral centre. Addressing the participants, Card Braz de Aviz said: "You and I have received the gift of a Christian life and mission. We are called together to receive the Holy Spirit and to proclaim the Good News to all. For me, it is very important to visit the places where you live and to bring you the blessings of the Holy Father." "In my life, I have never seen so many young people follow God as sisters,” he said during the meeting with the nuns. “We follow God’s path,” he explained. “This is a special journey. Let us give ourselves to Jesus to reach the aim of his love. This is the only reason for the consecrated life." The next day the cardinal travelled to Huế (Thừa Thiên-Huế province) where he presided over a working session with representatives of the local archdiocese and nine other dioceses before meeting the Association of Religious and celebrating Mass at Phủ Cam cathedral. 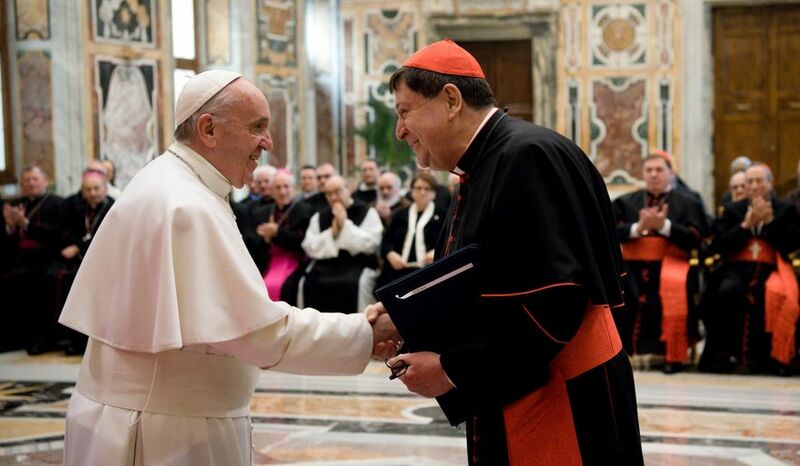 In Huế the cardinal said that "the Holy Father Francis always has high regards for consecrated persons. They are the treasure of the Church, always faithful and living in the grace of their order or congregation. You do not stop trying to improve yourselves. The training in religious life is rational and conscious, and therefore awareness will transfer into our hearts." 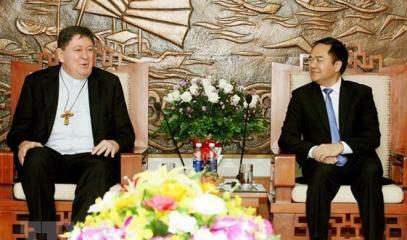 On 6 September, Card Braz de Aviz met Card Phêrô (Pierre) Nguyễn Văn Nhơn, archbishop of Hà Nội; hundreds of priests and 500 men and women religious were present. On this occasion, he expressed gratitude to the 117 martyrs of Vietnam for "the vitality and youthfulness that characterise the local Church." The next day, on the last stop of the visit, the Vatican delegation met with Vũ Chiến Thắng, head of the Government Committee for Religious Affairs (picture 2). 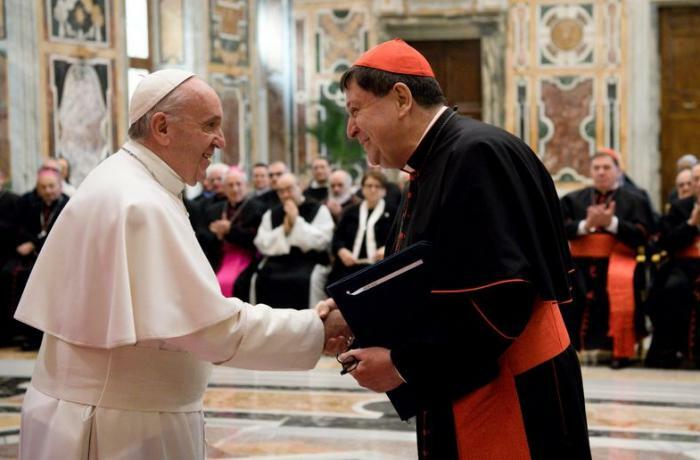 Welcoming the cardinal, the official stressed that "in last few years, the relationship between the Catholic Church and the Vietnamese government is more and more close." "We share and talk to find similarities and common denominators to build the Church and society, and to develop the country. The Vietnamese government highly values many religious orders, and many consecrated persons (men and women) have actively contributed to health care, education, as well as social or charitable activities."